USS Tripoli name sake was the Battle of Tripoli Habor. In 1803, after years of having our merchant vessels taken by the Barbary Pirates, the United States dispatched a squadron to Tripoli in present day Libya. The USS Tripoli (LPH-10) keel was laid on 15 JUN 1964 at the Ingalls Shipbuilding Corporation, in Pascagoula, Mississippi. Two years, one month, and twenty two days later, 6 AUG 1966 USS Tripoli as commissioned at the Philadelphia Naval shipyard, with Capt. Henry Suerstedt, Jr., in Command. After fit out at PNSY, Tripoli transited the Panama Canal and assumed her station in her home port of San Diego, CA in November of 1966. May 1967 brought her first Western Pacific deployment. Over the next seven years Tripoli deployed to the Western Pacific - Viet Nam theater four times, providing USMC airborne assault capabilities. The latter 1970s trough 1990 had Tripoli standing watch on the Pacific. She alternated deployments with her Iwo Jima-class amphibious assault ships, undergoing the routine cycle of maintenance and overhaul, refresher training, amphibious training, then several years alternating Western Pacific deployments with lesser voyages and state side training and upkeep. The Iraqi invasion of Kuwait had Tripoli underway for the Arabian Sea and Persian Gulf area of operations. In late 1990 Triopli was tasked with supporting mine sweeping operation in the Northern Persian Gulf. Mine sweeping was conducted by CH-53 Sea Stallion helicopters based on Tripoli. On 18 FEB 1991 Tripoli struck a mine. Her crew's professional efforts are credited with her staying on station in order to transfer mine sweeping operation to USS New Orleans, before departing for a shipyard in Bahrain for emergency dry docking. Several Western Pacific - Indian ocean deployments followed up to 1995. 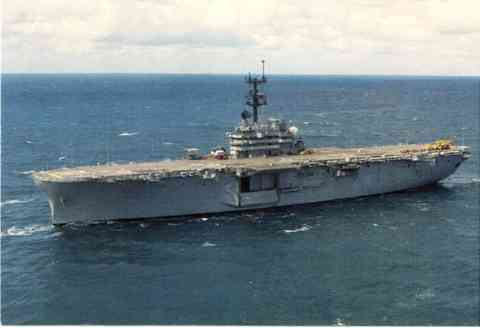 USS Tripoli was decommissioned on 15 SEP 1995. After initially being laid up Mare Island Naval ship Yard in Vallejo, California, her hulk has been used as a platform for mislle testing. The second Tripoli (LPH-10) was laid down on 15 June 1964 at Pascagoula Miss. by the Ingalls Shipbuilding Corp.; launched on 31 July 1965; sponsored by Mrs. Jane Cates the wife of General Clifton B. Cates former Commandant of the Marine Corps; and commissioned on 6 August 1966 at the Philadelphia Naval Shipyard Capt. Henry Suerstedt Jr. in command. Following three months fitting out at Philadelphia the amphibious assault ship put to sea on 6 November bound for the west coast. She transited the Panama Canal at mid month and arrived at her home port San Diego on the 22d. Final acceptance trials shakedown training and post-shakedown availability at Long Beach occupied the warship until she embarked Marine Heavy Helicopter Squadron (HMH) 463 elements of Marine Observation Squadron (VMO) 6 and some members of the staff of the Commander Amphibious Squadron (ComPhibRon) 5 on 1 May 1967 and departed San Diego bound for the western Pacific. On 22 May she arrived in the combat zone off the coast of Vietnam and disembarked HMH 463 and VMO 6 at Danang on the 23d and 24th before joining TG 76.5 just then finishing up amphibious landing Operation "Belt Tight" in the I Corps zone just south of the demilitarized zone (DMZ) between North and South Vietnam. She headed for the Philippines on 26 May arrived in Subic Bay on the 27th and relieved Princeton (LPH-5) as flagship of Amphibious Ready Group (ARG) "Bravo"/TG 76.5. In that capacity she embarked not only the task group commander's staff but also the staff of the Commander Special Landing Force (SLF) "Bravo" CTG 79.5 the 3d Battalion 3d Marine Regiment (Battalion Landing Team (BLT) 2/3) the men and aircraft of Marine Medium Helicopter Squadron (HMM) 164 Surgical Evacuation Team "Bravo " and Detachment "Bravo" of Tactical Squadron (TacRon) 11. On 8 June she departed Subie Bay for an extended tour of duty in Vietnamese waters. During her 1967 deployment Tripoli participated in eight amphibious operations all conducted along the coast of the I Corps tactical zone located in the northernmost part of South Vietnam. Her first operation codenamed "Beacon Torch " began on 18 June when marines of SLF "Bravo" were flown into the vicinity of Hoi An located on the coast midway between the DMZ and the southern limit of I Corps tactical zone. Between 18 June and 2 July the Marines operated ashore initially engaging an enemy force of about 100 men. After an air strike broke the enemy resistance they concluded their mission with a search and destroy sweep to wipe out the remnants of that force. All the while Tripoli remained offshore providing logistic support medical evacuation services for casualties and a platform from which to launch air support missions by the embarked Marine attack squadron. On 2 July she received the special landing force back on board and immediately headed north to the coast of Quang Tri province to answer a call for assistance from Marine Corps units near Con Thien which had suffered heavily from bombardments by North Vietnamese regulars. The ensuing Operation "Beaver Track" pitted SLF "Bravo" against the North Vietnamese troops to relieve the pressure on Marine Corps units based ashore with the III Marine Amphibious Force (MAF). Simultaneously with Operation "Beaver Track " SLF "Alfa" embarked in Okinawa (LPH-3) went ashore to engage the same enemy forces in Operation "Bear Claw." The two battalion landing teams joined III MAF Marines based ashore in a week-long struggle followed by an eight-battalion search and destroy sweep. Throughout the 12 days of "Beaver Track/Bear Claw " Tripoli steamed offshore within easy helicopter range to provide logistical medical and ground support. The two landing forces were later credited with a third of the 1 100 enemy casualties and with no small part in breaking up the enemy attack. "Beaver Track/Bear Claw" ended on 14 July and both battalion landing teams returned to their ships on the 17th. The respite from combat however proved brief. At dawn three days later Tripoli's marines stormed ashore in a combined waterborne-airborne amphibious assault on the exposed seaward flank of the Viet Cong 806th Battalion near Quang Tri City. The enemy forces avoided contact with the Marines by retiring hastily to the west where they were badly mauled by South Vietnamese troops. BLT 2/3 reembarked in Tripoli on the 27th for another brief rest before the equally brief amphibious Operation "Kangaroo Kick" which commenced on 1 August. Tripoli's marines landed in Quang Tri province north of Hue. Though the operation ended only three days later the marines did not reembark for the voyage to Subic Bay. Instead they changed operational control to III MAF while Tripoli and the rest of TG 76.5 spent two weeks at the Philippine naval base for upkeep. Tripoli returned to the Vietnamese coast near Hue on the 20th and backloaded SLF "Bravo" in time for the marines to participate in Operation "Belt Drive." On 27 August the battalion landing team once more went ashore via both helicopter and landing craft in Quang Tri province. Viet Cong and North Vietnamese resistance proved slight and after a three-day sweep of the Hai Lang forest the troops reembarked in Tripoli on 5 September. That same day Dupont (DD-941) suffered a hit from enemy guns on Cape Lay North Vietnam. Tripoli -- located not far away -- went to her assistance and evacuated 12 casualties by helicopter for treatment on board the amphibious assault ship. On the 17th because her entire complement of CH-46A helicopters had been grounded Tripoli launched the first all-boat landing from an LPH. In spite of swells eight to twelve feet high a rain squall 30- to 40-knot winds and visibility frequently less than one-half mile the boat landings for Operation "Fortress Sentry" came off almost without a hitch. Ashore near the Cua Viet river some seven miles south of the DMZ the marines moved inland but encountered no enemy resistance until the 23d. Then artillery and air support quickly extinguished the enemy's will to fight and the operation was terminated on the 25th The troops reembarked between 25 and 27 September and the task group headed back to Subic Bay for six days in port. Tripoli returned to Vietnam at Danang early in October and loaded 39 defective CH-46A helicopters for transportation to Okinawa where their tail pylons were to be replaced. Shortly after she departed Danang on 7 October her lookout spied an Air Force F-105 which crashed into the sea about two miles ahead. One of her helicopters flew to the scene rescued the pilot and returned him to the ship for medical treatment. Not long thereafter her lookouts caught sight of a second survivor of the crash. By the time her helicopter arrived on the scene an Air Force chopper had already picked up the man. Tripoli's helo assisted in the operation by taking on board the Air Force crewman who had jumped in to assist the survivor into the lift harness. The amphibious assault ship returned from the Ryukyus to Vietnamese waters at mid month. On the 17th CH-53 helicopters carried the battalion landing team to a point 10 miles south of Phu Bai in Thua Thien province. The following day the marines changed operational control to III MAF ashore for a search and destroy sweep along Route 1. Meanwhile Tripoli supplied logistic support until she cleared Vietnamese waters on 1 November bound for Okinawa with another 18 defective CH-46A helicopters. After brief stops at Okinawa and Subic Bay the amphibious assault ship returned to Danang on 10 November. After reembarking SLF "Bravo " she prepared for her last amphibious operation of the deployment Operation "Badger Hunt." On the 14th the landing force was lifted some 25 miles inland to the area near An Hoa in Quang Nam province. After silencing sporadic enemy resistance near the landing site Tripoli's marines joined elements of the shore-based 7th Marines in a successful search-and-destroy operation. Tripoli supported the landing force through the end of the operation on the 27th when the marines returned to the ship. She entered Danang on the 29th and began transferring the troops of the battalion landing team and their supporting elements to Valley Forge (LPH - ). The next day 30 November Valley Forge relieved Tripoli as flagship TG 76.5 and Tripoli got underway to return to the United States via Okinawa and Yokosuka. She arrived in San Diego on 23 December 1967 and began post-deployment standdown. Tripoli completed a restricted availability at Long Beach between late January and the end of March 1968. During the first three weeks of April she conducted a series of individual ship exercises and then rounded out the month with amphibious training. From 6 to 17 May the ship conducted refresher training and then returned to San Diego to prepare for her second WestPac deployment. On 12 June the amphibious assault ship stood out of San Diego on her way to the Far East. She stopped briefly at Pearl Harbor and at Okinawa before arriving at Subic Bay on 1 July. Between the 2nd and the 5th she embarked the 2d Battalion 7th Marines HMM 265 Detachment "Bravo" of TacRon 13 and other supporting units of the ARG "Bravo." On the 6th she departed Subic Bay and arrived the following day in the Vietnam combat zone. Tripoli's second tour of duty in the Orient closely followed the pattern of her first. During the next seven months she patrolled the coast of Vietnam near the I Corps tactical zone just below the DMZ in a position to launch her landing contingent quickly whenever they were needed by Marine Corps Army and South Vietnamese forces operating ashore. The first of her eight amphibious operations came the day after she arrived in the combat zone. Following preliminary naval bombardment Operation "Eager Yankee" opened with a combined airborne and waterborne assault. The marines of SLF "Bravo" charged ashore about 10 miles east of Phu Bai on the coast of the Thua Thien province. They then wheeled right and pressed north toward a known Viet Cong haven. The enemy avoided contact; and on the 16th the marines joined shorebased forces in Operation "Houston IV." That operation ended on 22 July and the battalion landing team returned to the ship the same day. However the marines enjoyed precious little respite. While Tripoli proceeded to the scene of a new operation feverish preparations allowed her to send SLF "Bravo" ashore again just 17 hours after the completion of reembarkation. For Operation "Swift Play " the troops rode helicopters ashore to an area about 10 miles southwest of An Hoa deep inland in Quang Nam province. The assault forces spotted several enemy formations but no engagements resulted. The following day BLT 2/7 transferred to the control of III MAF to conclude an operation designed to parry a major enemy thrust toward Danang. The landing force remained ashore operating under the commanding general 1st Marine Division in defense of Danang through the months of August September and November. Meanwhile Tripoli steamed on station offshore providing logistics and medical support departing Vietnamese waters twice between 22 July and 5 November. In mid-August she steamed to Subic Bay for repairs and in early October she voyaged via Subic Bay to Kaohsinng Taiwan for a liberty call. During all other periods she remained off the Vietnamese coast providing support services to the marines of BLT 2/7 operating ashore. On 5 November the special landing force ended more than three months of combat duty ashore and reembarked in Tripoli. Five days later HMM 165's helicopters and Tripoli's landing craft carried the troops ashore once again. In Operation "Daring Endeavor " the marines sought out and destroyed enemy fortifications and captured large quantities of rice. They concluded the action on the 17th and returned to the ship that same day. Three days later the amphibious assault ship launched her fourth landing another combined waterborne and airborne operation directed at an area in Quang Nam province just south of Danang. During Operation "Swift Move " initial opposition proved very light; and the landing force quickly transferred to the control of the 1st Marine Division for further action ashore in the continued defense of Danang against Viet Cong and North Vietnamese units. Tripoli continued support activities for the battalion landing team until 3 December when she offloaded what remained aboard of the marines' equipment at Danang preparatory to departing Vietnam for a liberty call at Hong Kong. After a five-day visit to the British Crown Colony she continued on to Subic Bay for a two-week availability. On 27 December 1968 she headed back to Danang. On 1 January 1969 she embarked BLT 3/26 and HMM-164 to reconstitute SLF "Bravo." During the remainder of her second tour of duty in the Far East Tripoli participated in two more amphibious operations. The first of these Operation "Bold Mariner " was hailed as the largest such maneuver since the Allied landings during World War II. Aimed at the Batangan Peninsula of Quang Ngai province where the entire population was considered hostile the operation sought to cordon off the peninsula and trap the 300 or so guerillas operating there. Both special landing forces "Alfa" and "Bravo " joined South Vietnamese troops and soldiers of the Americal Division in forming the cordon. Following a feint near Mo Duc the amphibious force headed for the real landing area. Navy guns softened the objective beaches and the troops went ashore on 13 Januaryall by helicopter. While the operation continued Tripoli remained offshore providing her marines with the everneeded logistical support and medical facilities. By 6 February the troops ashore had thoroughly combed the peninsula for Viet Cong troops so BLT 3/26 turned the mop-up operation over to the American and South Vietnamese soldiers and returned to the ship. The reembarkation of the marines was completed by 9 February just in time for Tripoli to launch her last amphibious operation of the deployment. The expected enemy Tet offensive required South Vietnamese troops to be withdrawn from Operation "Taylor Common " then in progress near An Hoa in Quang Nam province. SLF "Bravo" was to replace those troops in Operation "Defiant Measure." The landings began at 0800 on the morning of 10 February and the offloading of men and equipment continued for several days. Tripoli remained in the area until the 16th. Operation "Defiant Measure" was concluded on that daythough the marines remained ashore to continue Operation "Taylor Common." HMM-164 was disembarked before Tripoli began her voyage home. She departed Vietnam that same day and arrived in Subic Bay on the 18th. There she turned over her duties to Valley Forge. On the 22d she got underway for Yokosuka Japan and badly needed repairs before continuing on to the United States. She finally arrived back in San Diego on 19 March and began post-deployment standdown. Tripoli remained on the west coast until November. After leave and upkeep she began an availability period at the San Diego yard of the National Steel Company which continued until 11 August. Following refresher training in September and amphibious training in October she stood out of San Diego on 1 November to return to the Far East. After a brief stop at Guam on the 15th for fuel she continued on to Danang South Vietnam where she arrived five days later. During Tripoli's third deployment to the western Pacific the combat operations along the Vietnamese coast which had characterized her first two deployments were totally absent. Instend she busied herself with a series of amphibious training exercises and a series of "Keystone" operations redeploying Marine Corps units. Her first mission Operation "Keystone Cardinal " began on 20 November when she loaded the marines and equipment of BLT 3/4 for transportation to Okinawa. At Okinawa between 24 November and 2 December she disembarked BLT 3/4 and embarked BLT 2/9 HMM-165 and supporting units to constitute SLF "Alfa." On 2 December she departed Okinawa bound for the Philippines. She conducted upkeep at Subic Bay between 5 and 12 December and two amphibious exercises at Zambales on the 13th and 14th. She returned to Vietnamese waters on the 17th and cruised the area without incident until the 25th when she headed back to Subic Bay. In the Philippines minor repairs and more amphibious exercises occupied her until 6 January 1970. She made a six-day cruise to Vietnam and then returned to the Philippines on the 12th for more training. On the 25th she disembarked SLF "Alfa" at Subic Bay in preparation for a voyage to Vietnam to pick up homeward-bound marines. She entered Danang on 31 January and began embarking personnel from HQ III MAF 1st Marine Air Wing 1st Marine Division and III MAF Logistics Command. Later that evening she got underway for home. After a non-stop voyage of 17 days she arrived in San Diego on 16 February. She moved to Long Beach on the 23d to replace a cracked screw and departed that port on the 27th to return to the western Pacific. She reached Subic Bay on 15 March. Tripoli operated in the Philipines and at Okinawa conducting amphibious exercises in preparation for an exercise with units of South Korean forces. She arrived in Korean waters on 18 April and two days later began Operation "Golden Dragon." The combined American-South Korean amphibious exercise lasted until the 25th. Tripoli returned to Okinawa on the 27th. She briefly operated off Danang at the end of the first week in May and then visited Hong Kong for a week in mid-month. Late in May she returned via Subie Bay to Okinawa to disembark SLF "Alfa" and then moved to Danang where she disembarked ComPhibRon 9 and his staff and took on cargo for the voyage home. Tripoli got underway on 7 June and reached San Diego on the 24th. Tripoli spent the next 15 months on the west coast. Following post-deployment upkeep and local operations she conducted carrier qualifications in the southern California operation area in August and an amphibious exercise off Camp Pendleton. For the remainder of 1970 the ship occupied herself with individual ship's exercises and upkeep in preparation for an overhaul which began cn 1 February 1971. She left Hunter's Point on 1 June fully revitalized and returned to San Diego on the 3d to prepare for refresher training which took place in late June and early July. Amphibious refresher training filled the latter half of July. She made two brief training cruises during the first week in August: one with NROTC midshipmen embarked and the other with Marine Corps reservists on board. Local operations and preparations for her fourth WestPac deployment occupied the rest of August and the entire month of September. On 1 October Tripoli stood out of San Diego bound for the Far East. After stops at Pearl Harbor and Okinawa she arrived in Subic Bay on the 28th. The ship conducted amphibious training operations in the Philippines and made port visits to such places as Keelung and Kaohiung in Taiwan and Sasebo Japan. During her return from Sasebo to Subic Bay she received orders to deploy to the Indian Ocean with TF-74 a special contingency task force built around Enterprise (CVAN-65) in response to the Indo-Pakistani War which erupted on 3 December. The amphibious assault ship remained in the Indian Ocean for the duration of the brief war. The fighting ended on 15 December; and two days later Pakistan officially accepted the loss of its eastern provinces which became the independent nation Bangladesh. Tripoli remained with TF-74 in the Indian Ocean and the Bay of Bengal until early 1972. She returned to Subic Bay on 14 January and resumed training operations punctuated by visits to Singapore Hong Kong and Kobe Japan. She began operations in Vietnamese waters at the beginning of April operating on Yankee Station to provide search-and-rescue and medical evacuation services. She departed the combat zone twice once for upkeep at Subic Bay and later to exchange battalion landing teams at Okinawa. At the end of June she resumed flight operations in connection with troop movements. However instead of carrying embarked marines inland for amphibious landings her helicopters moved Vietnamese troops from point to point ashore. On 29 June Tripoli-assigned helicopters helped to transport 1 400 Vietnamese marines from Tam My to the vicinity of Quang Tri City during the allied counteroffensive to recapture areas of the I Corps tactical zone which had been overrun by North Vietnamese troops. As this operation -- codenamed "Lam Son 72" -- progressed Tripoli remained off shore evacuating casualties and waiting should the reserves be required. That necessity came shortly before noon on 11 July when her helicopters helped to insert the reserve Vietnamese marine battalion -- picking them up near Route 553 and landing them behind enemy lines about a mile and one-half north-northwest of Quang Tri City. On the 20th Tripoli departed Vietnamese waters bound for the Philippines where heavy monsoons had caused extensive flooding. She reached Subic Bay on 23 July and conducted relief operations until 4 August at which time she set course for the United States. Tripoli arrived at San Diego on 20 August and remained there until 10 October. After a six-day amphibious exercise near Hunter Liggett Point the amphibious assault ship returned to home port where she stayed through the end of the year. During the first two months of 1973 she operated out of San Diego and prepared to deploy to the Far East once more. She stood out of San Diego on 6 March for her fifth deployment to the western Pacific. Steaming via Pearl Harbor -- where she made a three-week stop for repairs to her high pressure turbine -- she arrived in Subic Bay on 17 April. There she remained and when not plagued by material casualties to her main propulsion plant conducted training preparatory to Operation "Endsweep " the removal of American mines from North Vietnamese waters. Though scheduled to sail for Haiphong on 16 June she was delayed by more problems in her propulsion plant. Nevertheless early the next morning Tripoli headed for North Vietnam and arrived at Haiphong on the 19th. That morning the Commander TF 78 embarked in the amphibious assault ship and began negotiations with North Vietnamese representatives over the conduct of Operation "Endsweep." Meanwhile Tripoli's embarked air group began providing logistics support and inter-ship transportation services. Major issues in the negotiations were resolved by the 28th and minesweeping operations began early that morning. Throughout the operation the ship provided a platform for helicopters engaged both in minesweeping operations and for those providing logistics and transport services. Periodically she retired from the area to replenish and to evade typhoons. Otherwise she remained in the minesweeping area until 18 July when she departed North Vietnamese waters in company with Inchon (LPH-12) and Ogden (LPD-5) bound for Luzon. Four days after her arrival back in Subic Bay the last American operation in Vietnamese territory ended and the "Endsweep" task force was dissolved. Operations reverted to CTG 76.5/ARG "Bravo." 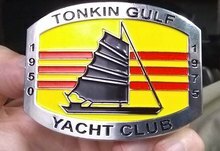 That organization lasted only two days for -- on the 27th -- the Commander PhibRon 1 broke his flag in Tripoli and she became flagship for TG 76.4/ ARG "Alfa." Between January 1974 and the end of 1976 Tripoli made two relatively routine deployments to the western Pacific. The first lasted from late July 1974 until late January 1975. During that time period she operated out of Subic Bay and engaged primarily in amphibious training exercises in the Philippines. The second deployment -- from mid-February to late October 1976 -- saw a repetition of this routine but also included a voyage to Guam for disaster relief duty as a result of typhoon "Pamela." She also participated in two joint American-Korean amphibious exercises conducted near Pohang Korea in March and June respectively. The second deployment ended on 25 October when she arrived in San Diego remaining there into 1977. The first six months of 1977 were spent in a Planned Restricted Availability (PRAV) at the Naval Station San Diego for the purpose of increasing propulsion reliability during the next deployment. While the PRAV concluded on 28 June it was necessary to tow Tripoli to the Long Beach Naval Shipyard to use the yard's extensive facilities for the reinstallation of Tripoli's low pressure turbine. The work was completed on 26 July and following successful sea trials Tripoli returned to San Diego on 28 July. Succeeding months vvere spent in refresher training and workup for the ship's forthcoming deployment to the western Pacific. On 3 November Tripoli departed San Diego. Chopping to control by the Commander 7th Fleet on 25 November she spent the next seven months in WestPac returning to San Diego on 22 July 1978. Following post-deployment standdown Tripoli received an inspection by the Naval Board of Inspection and Survey in September. On 16 October the ship commenced a three-month PRAV in preparation for a scheduled deployment to the western Pacific in 1979. Tripoli earned nine battle stars for service in the Vietnam conflict. Tripoli was decommissioned 08 September 1995 and transferred to the Maritime Administration at Suisun Bay 21 September 1995. Her name was struck from the Naval Vessel Register 15 September 1995.